Download the press release in English or French. ALFI continues to report high levels of assets under management (AuM), ending the year 2018 at €4,064.64 bn. ALFI continues to actively engage with policymakers on key issues such as the ESA review and to provide solutions for asset managers in the context of Brexit. 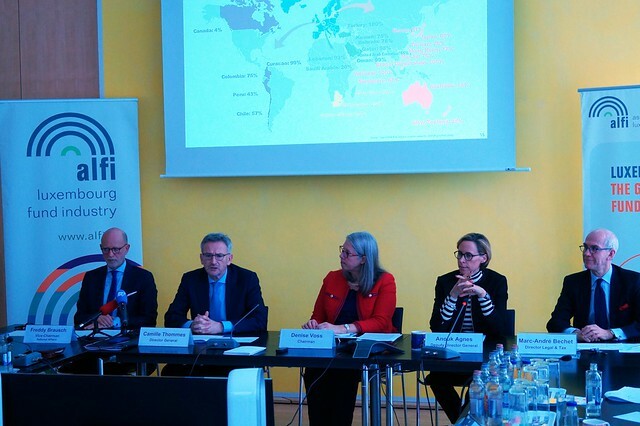 In 2018, ALFI responded to 15 consultations and issued 15 publications, guidelines, white papers and studies – on topics as varied as EMIR, PRIIPs, GDPR, risk management, AML/CFT and tax – not only to explain the view of the industry but also to help its members with the implementation of legal, regulatory and operational requirements. 23 UK-based asset management firms have publicly announced that they will create or reinforce their presence in Luxembourg to “Brexit-proof” their business. ALFI welcomes the press release issued by the national competent authority in Luxembourg (CSSF), in which it confirms that the required cooperation with the FCA as its UK counterpart shall be in place on 29 March 2019 in the event of a “no deal” Brexit. Delegation to UK delegates shall thus continue to be possible, on condition however that the UK delegates meet all applicable requirements. While the EU Commission’s Proposal of September 2017 on the review of the European Supervisory Authorities (ESA) and the Brexit negotiations are in principle separate, the link between them is undeniable. Denise Voss states: “ALFI has never seen the benefits of these proposals for the end investor. We do not embrace direct supervision by ESMA, as we believe that close oversight of market participants and products by national competent authorities guarantees the best and most efficient level of investor and market protection. Furthermore, we are very concerned about the proposed review by ESMA of delegation arrangements and outsourcing to third countries. This would introduce an extra layer of regulation, additional costs, delays in time to market and uncertainty. Delegation has been a tried and tested practice in the fund industry for 30 years, and there is no evidence of a market failure resulting from delegation. The delegation model is a cornerstone of the global success of the European asset management industry and as such provides investors with access to expert asset management from around the globe. ALFI has been an early mover in actively promoting responsible investing opportunities for asset managers. Convinced of the opportunities for and the key role of asset management in fostering sustainable finance, ALFI supports the EU Commission’s Action plan on Sustainable Finance and is closely monitoring the first concrete regulatory proposals. Luxembourg is already the leading fund domicile for responsible investment funds in Europe, accounting for 31% of funds and 39% of total AuM in European responsible investment funds. ALFI welcomes the EU Commission’s first legislative proposals published on 24 May 2018, as they tackle transparency and provide more clarity in the market. Information and trust are at the heart of the continuous development of the sustainable finance market, i.e. to fight misleading information (”green-washing”). ALFI believes that sustainability factors should be taken into account in investment decisions when it is in the best interests of the client. In addition, applying sustainability risk to the investment process is an important risk management tool which helps to focus on investment performance over the long-term. Finally, ALFI also cautions against restricting the sustainable finance investment universe available for EU asset managers and EU funds as a consequence of regulatory requirements, which would create an uneven playing field in comparison to non-EU managers and funds. ALFI sees the pan-European personal pension product (PEPP) it as an interesting opportunity for asset managers. European households must increasingly assume responsibility for their own financial well-being and long-term savings, including retirement. At the same time, if the European economy is to be strengthened, workers’ mobility must also increase. Fragmentation between national markets and limited portability of personal pension products however make this difficult as present. Interest in UCITS continues to increase in markets around the world. Non-European markets account for 24% of UCITS assets with Asia representing 13% of cross-border assets. ALFI expects UCITS and AIFs to be key beneficiaries of the Capital Markets Union, which aims to increase investment and the choices available to retail and institutional investors in Europe and to migrate some of the vast pool of deposit savings into managed investments. Looking outside of Europe, the global footprint of UCITS will surely serve well in the coming decade as populations in many markets are encouraged by their governments to take on the mantle of pension provision. “As in the past, ALFI will be at the forefront of all these opportunities to increase the global footprint of UCITS. Australian, Brazilian, Mexican and pension funds in other jurisdictions are showing interest and we will continue to visit them regularly to stay on top of regulatory and business developments.” says Camille Thommes. Recently, in recognition of the long-standing cooperation between Luxembourg and Hong Kong, the Securities and Futures Commission (SFC) of Hong Kong and the Luxembourg CSSF have signed a MoU which provides a framework for the mutual recognition of eligible funds offered, marketed and distributed to the public in Hong Kong and to retail investors in Luxembourg. It serves as a facilitator for the approval and marketing of investment funds in both jurisdictions. - creating a new category of benchmarks which will help investors compare the carbon footprint of their investments.